Picture this − you are engrossed watching a prima ballerina from the world-famous Bolshoi Ballet pirouetting her way through Tchaikovsky's 'Swan Lake'. Her performance is impeccably spellbinding, despite (you're amazed to notice) her wearing, not ballet shoes, but a pair of "size ten" hobnailed boots! 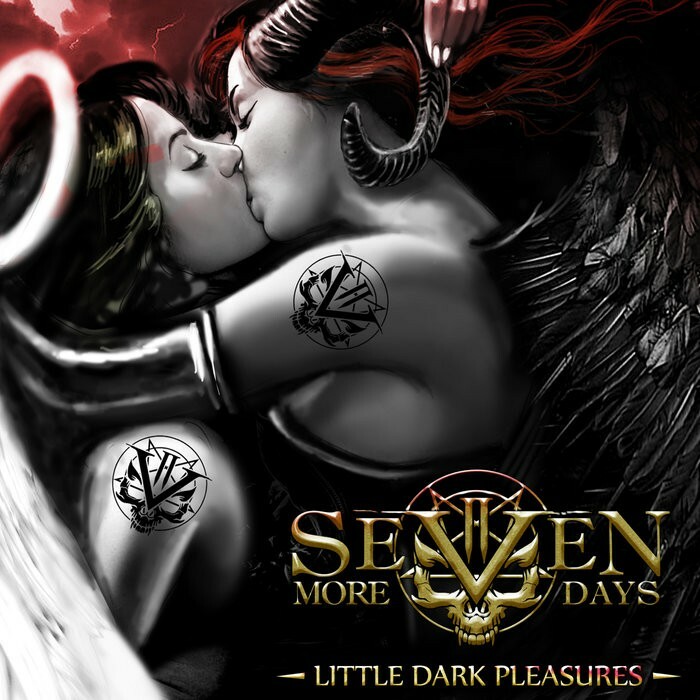 A strange image you may be thinking, but a perfect analogy for this debut album from north-west of England's Seven More Days, as 'Little Dark Pleasures' kicks hard whilst simultaneously emanating beautiful moments of melodic artistry throughout. Seven More Days may be relatively unknown, yet principal protagonists Darren "Daz" Valentine (vocals/bass) and Chris Porter (guitars/bass) are certainly no neophytes in this crazy world we call Rock. For almost three decades, these two intrepid musicians have courted fame and fortune. Supporting Status Quo (in 1995, under their previous band moniker G.O.D.) and Mamas Boys, plus forming a close working relationship with distinguished producer Pete Waterman (yes, him of Kylie, Rick Astley and Donna Summer fame!) are just three notable trysts hitherto; however, has their eventful past finally come to fruition? 'Little Dark Pleasures' commences in serene fashion with the acoustic prologue of 'Salanders Tale', but this tranquillity is short-lived as the thunderous rhythm section, energetically driven by session drummer John Dagnall, and the explosive lead guitar of Porter kick in. It's a mid-tempo, foot-stomping affair that quickly establishes the band's parameters, evoking fond memories of early Black Sabbath. 'Dazzle' follows and it's perhaps the weightiest song on offer; Valentine's vocals are menacing and moody, yet melodious, and span the Rock spectrum with some style. This slow/mid-tempo onslaught continues with 'One Mind', 'Back From The Dead', 'Castles In The Sky', 'Like Rain' and closer 'Ode To Innocence'. If you're a lover of Sabbath, Led Zeppelin, Dio, Dokken, Mötley Crüe and the more decorous of Metallica's material, then there is an abundance of pleasure to be had here. 'By Your Side' is the only up-tempo track on offer, reminding me in places of Crüe's 'Wildside'. Irrespective of pace, throughout the opus Porter's scintillating guitar breaks are never far away. There are a couple of ballads strategically placed, and they give the listener brief respite from the omnipresent intoxicating tuneage. Both 'Not Too Long' and 'Don't You Know' have sophisticated orchestration that perfectly modulates the intensity. Seven More Days have indisputably hit the ground running because this album is quite simply breathtaking (the album artwork is rather impressive too! ).